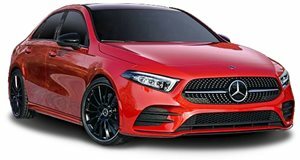 Tempted by the new Mercedes A-Class sedan, but not impressed by the 188 horsepower offered by the A220 – the only version that's been available in these United States to date? Well we have good news for you. Or rather AMG does. The new Mercedes-AMG A35 sedan revealed today is still powered by a 2.0-liter turbo four. Only this one kicks out 302 horsepower, with 295 lb-ft of torque to go along with it (far more than the A220's 221 lb-ft). That's enough to send the little luxury sedan scurrying to 60 mph in 4.7 seconds. It's the same powertrain that powers the A35 hatchback offered overseas, but with a trunk instead of a liftgate at the back. It's just the ticket to fend off the Audi S3, and it ought to keep customers happy at least until the full-on A45 arrives with as much as 416 horsepower to tackle the 400-hp RS3. 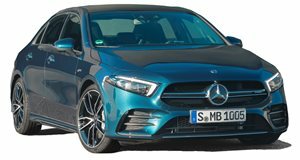 Though the S3 packs slightly less power (with 288 hp and 280 lb-ft to the A35's 302 hp and 295 lb-ft), Mercedes-AMG's quoted 0-60 mph time comes in one-tenth slower. But we'd have to drive both in real-world conditions to see how they'd really compare. Of course the boys in Affalterbach didn't just drop a new engine under the hood and call it a day. They also retuned the suspension, the seven-speed dual-clutch transmission, and the standard 4Matic all-wheel drive system. Four-piston calipers grip 350-millimeter perforated and ventilated brake discs at the front, with single pistons and 330-mm rotors at the back. The performance division also gave it some visual enhancements to set it apart from the A220 and amp up the aesthetic excitement factor. The standard 18-inch (and optional 19-inch) alloys are specific to the performance model. The grille, front bumper, trunk-lid spoiler, rear diffuser, and dual exhaust pipes are also unique to the A35, which benefits as well from a reinforced body shell. Inside it gets a new steering wheel with a flat bottom, beefier rim, perforated leather grips, red topstitching, touch controls, and an optional AMG Drive Unit controller to switch between Slippery, Comfort, Sport, Sport + and Individual dynamic modes. Behind it are galvanized shift paddles and an AMG-specific digital instrument cluster to complement the MBUX infotainment display with Track Pace telematics. Customers can also spec the interior in a combination of microfiber and (somewhat surprisingly) faux leather. Pricing and availability have yet to be released, but expect an MSRP close to $45k. Once it reaches showrooms, buyers will be also able to choose between optional Aerodynamics and Night packages to further augment the visual impact.